I have made them many times, and I think the big attraction is the salt that sneaks into the chocolate for a wow! moment. So it got me thinking, what if I skipped the salt and added some salted nuts? Would I get that sweet/salty combo I love? Why not try, right? Or, what about these amazing pecans we got at Christmas? They are unsalted, but they may fit nicely into the recipe as it is. These cookies are SO easy, I do everything in the food processor. Of course it has morphed and changed since I first posted it, so here we go again. My favorite nuts come from Trader Joe's, and I am thrilled to be moving to Nashville where I'll have one! The salted, shelled pistachios are delicious and the macadamia nuts from Australia are delicious. I decided to whip up a batch of cookies, and I basically divided the batter into three parts. I left one pure and chocolately, dropped the pistachios in one, and the macadamias, (chopped) in one. I think the macadamia nuts worked the best with the dark chocolate. The pistachios seemed to get a little lost, and of course the no nut version is as good as always, perhaps still the favorite. I am thinking I may try some dried cherries, maybe some toffee, even orange is delicious with dark chocolate. So lots of experimenting to come. Add flour, chocolate chunks, salt, and nuts. Process using on/off pulse until just combined. Do not over process. Mound dough onto sheets in 2-3 Tablespoon clumps about 2" apart. Bake 12 minutes at 350, rotating sheets halfway through. Cookies should be slightly firm to touch, but careful not to over bake. Cool on rack. Makes about 2 dozen plus a few. They are seriously rich, so I like to make them smaller, but watch the baking time, gooey is what you aim for! So, what are ya waiting for? Get in there and bake! Dark and Stormy, not the weather...my frosted mug (see the photo below). You see I really like cocktail hour, not that I drink a lot, I just drink, well, often. Five o'clock is sort of a sacred hour around here. 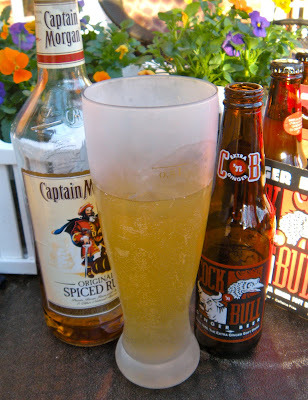 I love a glass of wine (Cab or Pinot please), a frosty beer, or Scotch and soda water with a hunk of lemon. I tend to steer clear of mixed drinks. I enjoy one every now and again, but they can get me into big trouble. Not because I drink in excess, but there is this small allergy I have and I can only pinpoint a few culprits. But I digress...blame it on the rum. 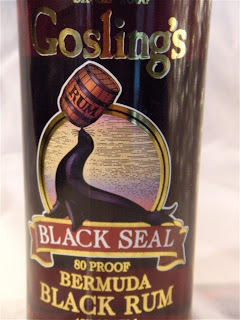 I made the Dark and Stormy just as directed, and my land...This Goslings Rum is over the top. 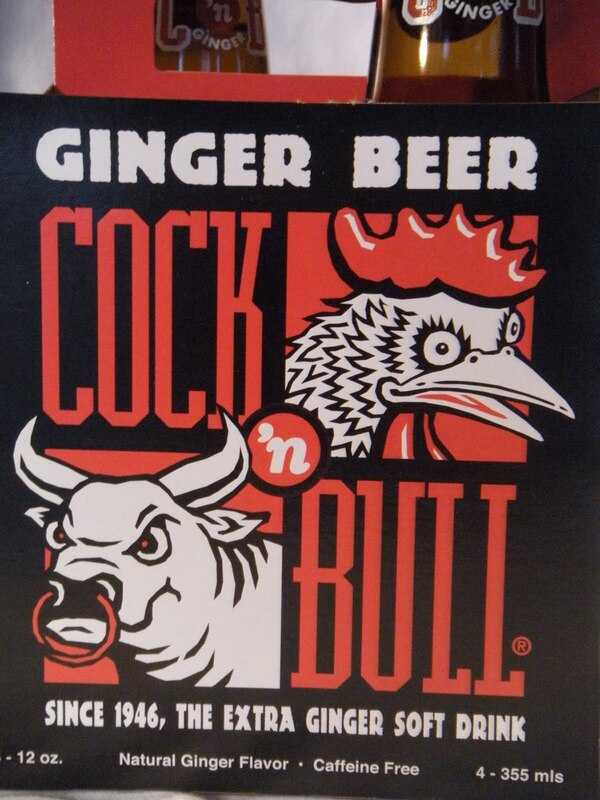 It has a very distinct flavor, and with the Ginger Beer, well it is deeelicious. Am I slurring yet? 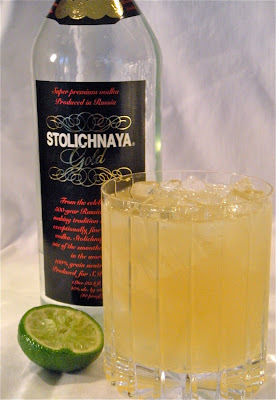 I gave Scott the Moscow Mule, and he gave it a thumbs up made with Stoli Gold. But I am headed (tomorrow, sober) back to the market for more Ginger Beer. And what a coincidence that I have 3 weather alerts on my phone as the severe weather comes in tonight, high winds, hail, possible tornadoes. Perfect stormy weather! What I have discovered on this cocktail journey is that it is quite fun trying new concoctions....I may have to experiment more! Also, blogging while drinking cocktails especially strong cocktails makes spell check a necessary addition! But I also like the idea of taking one ingredient (in this case that Ginger Beer) and sort of finding its best presentation. There are so many ideas swirling in my rum-crazed brain...where to begin? For now, though, get in there and have a Dark and Stormy! Cheers! So, if you read the post prior, you know that I have reopened my book, Chocolate and the Art of Low-Fat Desserts. 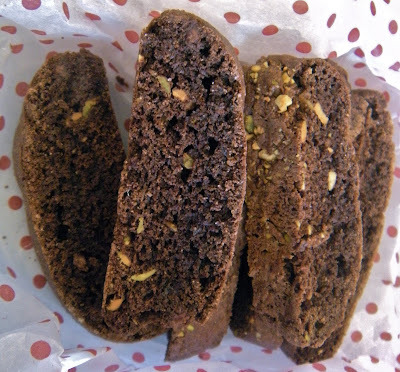 The chocolate biscotti is where I started and then moved on to souffles for Valentine's dinner. My parents and a "special friend" I'll call A. joined us for smoked ribs (Grandpa's request) with all the trimmings. And dessert had to be something chocolate, right? So the souffles were the logical choice because I have these adorable heart ramekins I HAD to use. The pictures stink. Sorry, but we had been cooking all day, had a little wine with dinner and when the souffles came out I was like...."Waaaaait! I need a picture." Six of them with spoons in hand, waiting for me, no pressure. See, this is real life here. We bake, we eat. So, my apologies. Preheat oven to 350°. Spray souffle cups with non-stick spray and coat with sugar. Tap out excess into next cup and so on. Sift the powdered sugar, cocoa and flour into the top of a double boiler. Add the milk and ½ cup water, and whisk until smooth. Cook over gently simmering water, whisking constantly for about 10 minutes or until thickened. Remove from heat and set aside. Bet the egg whites with the cream of tartar on medium until soft peaks form. Gradually add in the granulated sugar and beat on high until stiff peaks form, do not over beat to the point of being dry. Whisk the egg yolks and vanilla into the chocolate mixture. Fold about a quarter of the egg whites into the chocolate mixture to lighten it. Fold in the remaining whites. Now, you can see the swirly variations of chocolate from my folding, right or wrong? Not sure, but they were delicious! Divide evenly among the cups. Souffles can be covered and chilled at this point to bake later, up to 1 day. Place souffles on baking sheet and bake uncovered for about 15-17 minutes, a little longer if they were chilled. Souffles should puff well above the rim of the cups and a toothpick inserted should come out with moist crumbs. Under baking makes it more pudding like, over baking makes it dry and icky. To serve, dust a little powdered sugar, or just pass the whipped cream! A little fruit would be good too! Note: The sugar coating on the ramekin is what allows the souffle to climb the sides and puff up. It gets wonderfully crunchy. The ramekins are 4-5 ounces and the recipe makes 8, mine made 9. So the vedict was 7 thumbs up! It was warm and gooey and rich and delicious. For 127 calories and 2.6 grams of fat? Bring it on, why wait until Valentine's Day?! Get in there and bake! ½ teaspoon almond extract, optional (I opted out) Preheat to 350 °. Toast the nuts briefly in the oven. Cool completely and chop. Reduce oven to 300° and line baking sheet with parchment. Whisk flour, cocoa, baking soda, salt and espresso powder in a bowl. In food processor, chop the chocolate with about a quarter of the flour mixture until crumb-like. I toss the rest of the flour mixture in the processor and use the bowl for the eggs. Beat the eggs and egg whites with the sugar, vanilla and almond if using. Mixture will be thick and sticky. Pour in flour mixture in processor and pulse to mix. Toss in the cooled nuts, mix quick. Shape into 3 skinny logs about 12" long and bake for 45 minutes. They will spread. Cool the loaves for about 15 minutes and remove from pan. Slice them with a bread knife and return to pan and bake again for 20-25 minutes until crispy. Flip over halfway through. Cool and store airtight. Now, if you have shoddy dental work, be careful. The egg whites make these cookies pretty hard. But biscotti are shaped long for a reason...to dunk. The Itlaians prefer Vin Santo, but since we tend to eat these around the clock, I stick to coffee, tea and milk. They are wonderful and satisfy a chocolate craving for sure. Her stats say 47 calories per cookie in a batch of 50-60. Stay tuned for the low fat chocolate souffles....they were delish! Ah, the dreaded Valentine's Day. That is the great thing about being married and having kids. Lots of Valentines! I always cross my fingers for some super dark chocolate, and I always buy a little heart shaped something for my loves. Because I just never got around to extra holiday baking at Christmas, I never gave a box of treats to Christina's teachers. I felt pretty bad about that. Everyone knows I'm the baker, and how hard is it to put together a little something? Well, this year it was really hard with work. So we decided we would give them a sweet Valentine. Since it falls on a Monday, I sent the treats off on Friday so they could enjoy them over the weekend. I packaged the cookies in little Valentine's Chinese take out boxes. Very cute. There is something about an imminent snowfall in the South. The really big and sure ones get hyped up for days, it is all anyone talks about. That's what it was like this week. Even though we had a quick, fluffy snow on Monday, the Wednesday Snow was all the buzz. So on Wednesday morning Nic had an errand to run in a part of town I don't get to often, so I had him take me to the Winchester Farmer's Market before the snow hit. This is a jewel in Memphis, but it needs heat. 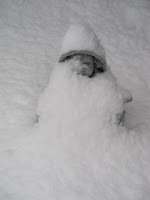 Thankfully I was dressed appropriately, I mean after all, the snowfall of the year was on its way! So while people packed the chain stores getting chili fixings and milk, I relished in the aroma and sights of the biggest International market in Memphis. The Market isn't open air, it is in an old grocery store, but it is sprawling and downright cold when its in the 20's outside. It is laid out like a traditional store, but there is very little traditional food (in our terms) here. The produce department is the best in town. Period. They carry the basics, but instead of 3 kinds of pears, they have 8, 6 kinds of oranges, 3 kinds of bananas (regular, baby sweets and plantains), apples, limes (cheap, cheap, cheap) and then the veggies. The greens are fresh and line an entire wall. At the supermarket they are crammed in on top of each other, here they breathe, and are separated so if you grab collards, you're going to get collards. They sell 4 kinds of sweet potatoes, at least 15 kinds of peppers (did I mention how cheap it all is?) and even aloe leaves and cactus leaves. This is a market for people who still eat the food of their ancestors. The signs give you country of origin, and most was domestic, which is interesting. The strawberries (tasteless, hard little buggers) at the chain market were from Mexico, here they are from Florida and are deep red and juicy. I was amazed how much of the unusual items were grown in the U.S. In the produce department I could not resist fresh garbanzo beans. But we'll get back to those. After produce, the back of the store is all fish and meat. Tanks with fish swimming about, eels and catfish, and a case full of dozens of kinds of fish and shellfish. They have fish mongers who can cut the fish on the spot. Fillets? No problem. gutted and whole? Okay. Whatever you want. Then the meat. They have real butchers. They pack, grind and wrap apparently right there. Chicken feet or cow tongues, ox lips and hooves, all for sale. This is a market that knows its customer base. There are no bins of orange tagged mark down meats, at least not on this day, and the cases are full and everything is fresh and clean. And the store goes on. The grocery aisles are organized by countries. I think. I can't read a lot of the labels, but you start with the Mexican and Central American groceries. Beans, flours, hot sauces, canned veggies, spices, even candy and cookies. Then comes the Asian aisles. Japanese, Chinese, Taiwanese, Korean, those I know for sure. Sauces, oils, rice (OMG the rice selection! ), teas and again candy and cookies. It is so fun to shop and guess what lies in the colorful and sometimes quite funny packages. Then we have frozen food, drinks, and misc. end caps with crazy stuff. The Chinese New Year stuff was 25% off. Colorful trays with candy (I think) and bright red pigs, although I thought it was the year of the rabbit. There is so much I do not know. But I do know they are missing a bakery. At one time they sold some fresh baked items up front, but it wasn't a real bakery, and I suspect the health department wanted that stuff made on the premises or made from a "real" business. Wouldn't it be wonderful to get authentic sweets on the Day of the Dead? Or fresh Vietnamese buns that I hear so much about? Maybe someday in the future. So what did I spend $60 on? Lots of produce. Limes, sweet potatoes, tomatoes, peppers, onions, greens, and of course those fresh garbanzos. Some tilapia fillets and spicy Mexican cheese. Fish sauce, hot chili sauce, popcorn, rice vinegar, and some beans. I also bought a bag of pot stickers and spring rolls, because I am guessing they are a little more authentic than the ones at Costco that my kids love. This is not a run in and grab a few things kind of store. This is the store where you have your phone with apps ready and I carry the Food Lover's Companion. It is after all, a learning experience. So fresh garbanzo beans. They were about $3.99 a pound, but they are so light, I didn't get anywhere near a pound. They are encased in these fuzzy little pods and were a fresh spring green color. I jumped on the Internet when I got home and read the blogs, the food sites and decided there was no reason to go overboard here. I rinsed them and sauteed them in a fry pan in olive oil. Sizzling hot. They have to get good and browned because even though you don't eat the pods (think edamame) you want that charred flavor as you rip out the bean from the very fibrous pod. Don't forget the Fleur de Sel. They were delicious. Nic declared if he owned a restaurant he would serve these to everyone, I agree. They were particularly enjoyable with the snow coming down and the city at a grinding halt. A snow day and another memory made. This week Christina "signed" her commitment to play volleyball at Millsaps College. Yes, I know that you cannot get an athletic Scholarship to a D3 school, (there are other scholarships). But you can give a commitment when you are recruited, and that's really what this represents. Her all girls high school recognizes the students who will play at the next level with an amazing ceremony. We sat with Christina as her entire Senior class and teammates looked on and 6 different people spoke about my girl. It was a very humbling experience for us all, and Christina felt like a rock star. There was a cake from our favorite cake baker (no, it wasn't me) and of course I made cookies. 8 dozen of them, I was worried they wouldn't get eaten, but no worries, those girls swooped in. Making volleyballs is a tricky icing job, and I worked with stenciling and new tips. I need a little more practice, but that shouldn't be a problem. We have four more years of volleyball ahead of us, a new school and lots of purple in our wardrobes! 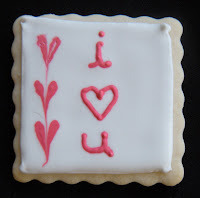 A while back I did a post on Iowa Sugar Cookies . I am a graduate (after a party stint at the University of Colorado Boulder), and Scott is also a graduate. But Scott was a little more involved at Iowa...he was on the "Spirit Squad". Loosely translated, he was a cheerleader. And just between you and me, what a gig that was. He went to all the football games. They take good care of you providing transportation, meals, lodging, and then of course you have these great football venues to be a part of, like The Big House at U of Michigan and its 100,000+ fans. In 1982 Scott was lucky enough to cheer at the Grandaddy of them all, The Rose Bowl. Back then it was the venue for the Big 10 Champion vs. the PAC 10 Champion. But I digress. This is about school spirit. I had that Iowa cookie cutter for many years, but it wasn't until this next generation was there that I started baking them up. We don't get to many games, but if we lived closer, I'd be the Hawkeye Cookie Girl for sure. 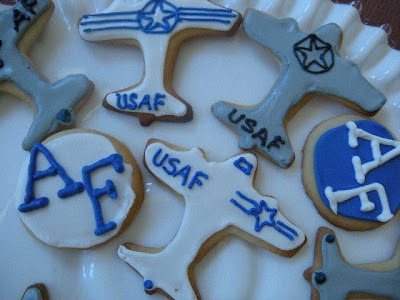 I have also made my share of Air Force Academy cookies. Mostly for graduates and parties here for the parents. We only got to one or 2 games a year, and they are so far away, but it wasn't like any other college experience. But, this too has changed as Nic had traded in his camo for civvies. He will likely be an Sooner in the fall, and find out what a big university has to offer. I will be on the hunt for a conestoga wagon cookie cutter. But today is Super Bowl Sunday. And although we declined the party invites, we will watch the game and enjoy the decadent bar food here at home with a beverage or two. I'm not a huge pro football fan, so once a year I enjoy the game. I find at parties, the women get shooed out from the big TV, and the men don't care so much about the commercials. I also enjoy lounging in front of a fire, flannel PJs, slippers...you get the picture. Besides that, GLEE! is on after the game and Scott would be like "What? We have to rush home to see whaaatt?" So we are home tonight. I did a few cookie orders, and lucky for my chums they are all Packer fans. An old college friend of Scott's played for the Packers when we were first married, I never saw him play at Lambaugh Field (chill factor was too low), but we saw them play at Atlanta when we lived there. It's been a few years since Ron suited up, but you never lose your loyalty to a team. So today, Go Packers! It's a funny saying. When life gives you lemons, make lemonade. Or as my Facebook friends suggested, lemon meringue pie, lemon bars, lemon drop martinis and lemonade and vodka! I had an enormous load of lemons dropped into my perfect little life. In the big picture, the real world, the life and death of daily life, is it all that bad? Well, not now. I have had all my emotions and am moving on. And I made lemon cookies. I had to bake for inventory, everyone brings something to eat. So of course I brought some sugar cookies and decided to get rid of some of the lemons. First the sugar cookies. I used my regular cookie recipe which bakes up pretty hard. Then I tried a different icing. It's called Meringue Powder Buttercream and I found it on Karen's Cookies. After watching her videos on decorating cookies, I decided I needed to try her go-to icing. It tastes very creamy, and the color saturation was much better than with regular royal icing, perhaps because there is fat in it? No idea. It never gets rock hard like royal icing, and it also kept the cookies rather soft. It won't work for my baking, stacking, mailing, but for a plate of sugar cookies, why not? Now to those dang lemons. I really wanted a cookie that I could bake up in little cookies because I knew there'd be lots of stuff to eat at inventory. Consulting my favorite book, Classic Home Desserts by Richard Sax, I found John Thorne's Lemon Icebox Crumbles. They were ridiculously easy to make, and have an amazing lemon punch to them. But I didn't get that crumbly flaky cookie texture. Did I over mix? Add too much lemon juice? Not sure, but this is a keeper for me. I am going to try a few tricks with it. Next time I will make them in the food processor, which does a quick job of this type of cookie. 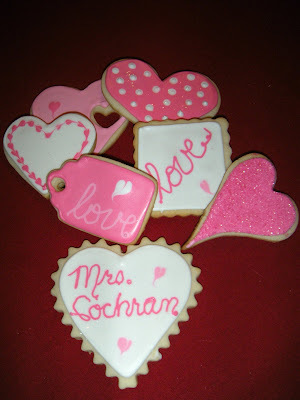 I added the red sugar so they would look good with my red, orange and pink Valentine cookies. Preheat oven to 350° and on Silpat lined cookie sheets, roll 1 inch balls and flatten slightly with a fork. Bake about 12-15 minutes until pale and gold. Cool completely. So, moving on. Some new things to adjust to. Everything happens for a reason, strength through adversity, God has plan, I have heard them all. They are easier said than believed, but sometimes you have no choice but to have a little faith. Here goes.